Summary: After trained examiners and accomplished business professionals performed a thorough assessment of this work, Daniel Markovitz has been selected as recipient of an internationally recognized award from the Shingo Institute, part of the Jon M. Huntsman School of Business. The author will receive the award at the 28th International Shingo Conference occurring April 25-29, 2016 in Washington DC. LOGAN, Utah — The Shingo Institute, part of the Jon M. Huntsman School of Business at Utah State University, has awarded Daniel Markovitz with the Shingo Research and Professional Publication Award for his book, “Building the Fit Organization: Six Core Principles for Making Your Company Stronger, Faster, and More Competitive.” As founder and president of Markovitz Consulting, Markovitz helps companies improve profitability and performance one process at a time through the application of lean concepts. “Receipt of the Shingo Research and Professional Publication Award signifies an author's significant contribution to advancing the body of knowledge regarding enterprise excellence,” said Ken Snyder, executive director of the Shingo Institute. The corporate landscape is littered with the carcasses of companies that have failed in their pursuit of the Toyota Way. Their efforts fail precisely because they’re trying to copy Toyota. Trying to be like Toyota is a mistake. What leaders need to do instead is learn from Toyota—learn how to convert their competent organizations into dynamic, constantly improving, profoundly customer-focused entities. A “fit” organization has the ability to continually improve in a manner that delivers superior performance and results over the long haul. 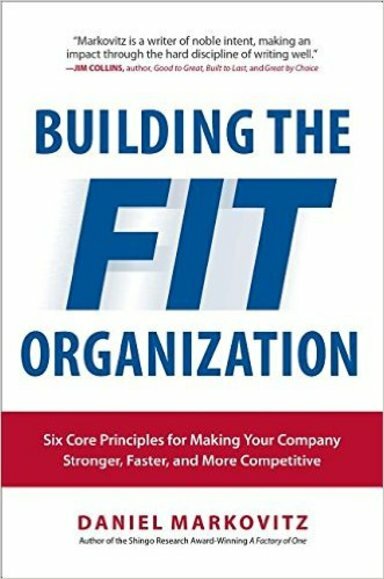 “Building the Fit Organization” distills the lessons from the Toyota Production System into six core concepts, and couches them in the easily understandable language of physical fitness and athletic excellence. In this practical, hands-on guide Markovitz walks you step-by-step through the process of making lean as intrinsic to your company as the pursuit of profits. You will learn how to make an unshakeable commitment to increasing the value provided by doing the right work in the right way with continuous monitoring of processes and structured coaching for everyone. Markovitz will receive the award during the Awards Gala of the 28th International Shingo Conference in Washington D.C. The conference is a five-day event featuring a selection of workshops, plant tours, keynote speakers and breakout sessions designed to provide ongoing knowledge, insights and experience for organizations in pursuit of operational excellence. Housed at the Jon M. Huntsman School of Business at Utah State University, the Shingo Institute is named after Japanese industrial engineer Shigeo Shingo. Shingo distinguished himself as one of the world’s thought leaders in concepts, management systems and improvement techniques that have become known as the Toyota Business System. Drawing from Shingo’s teachings and years of experience working with organizations throughout the world, the Shingo Institute has developed the Shingo Model™ which is the basis for several educational offerings including workshops, study tours, conferences and the Shingo MBA. It also awards and recognizes organizations that demonstrate an exceptional culture that continually strives for improvement and progress. Those interested in more information or in registering to attend the 30th International Shingo Conference may visit www.shingo.org.